If a person could not take care of a pet, a veterinarian would speak out. If a pet was living in a place where it could not get something that it needed, a veterinarian would speak out. Clearly there are circumstances when a veterinarian would speak out. But would it be only in defense of a pet? What if a pet presented a danger to its owner? What if a pet presented a danger to children living in the home of the pet's owner? Wouldn't the veterinarian's greater knowledge of the danger, and the veterinarian's role as the owner's trusted advisor, require the veterinarian to speak out? The enlightened view is that a person has a duty to speak out when the person has advanced learning or experience and sees a danger to other people. At the very least, it's a moral duty, a requirement of the heart, of the soul, of a person's humanity. 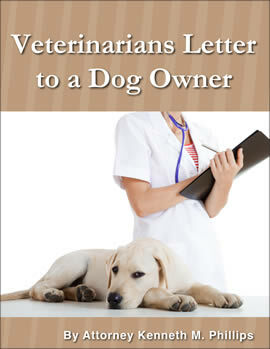 Because a veterinarian clearly has a moral duty to speak out if a pet presents a danger to its owner or its owner's children, he or she should get "A Veterinarian's Letter to a Dog Owner." It tells the client that the veterinarian appreciates being the owner's trusted advisor, and relishes the opportunity to serve both the client and the client's dog. It then goes on to explain that the dog is a high risk animal, and that similar dogs have caused substantial bodily injuries to their owners, family members of their owners, and others. The meaning of "high risk animal"
There is no doubt that a veterinarian who sees a danger to a family because of a high risk animal should warn them in a message that is clear and yet gentle and positive. Nobody will be able to say that you failed to warn them after they receive this letter. Get a copy. Use it as it, revise it, ask your lawyer to revise it. Speak out with it.